Okay, you got your 4 wheel drive vehicle dirty, it is now several years old & maybe you even have a scratch or two. Now is the time to finally start using that beast for real off road adventures. The real edge-of-wilderness trips you dream about when your sitting in your cubical wondering what life is really about. Fishing, camping, off roading and enjoying nature, of course! 4×4 camping in California is plentiful. 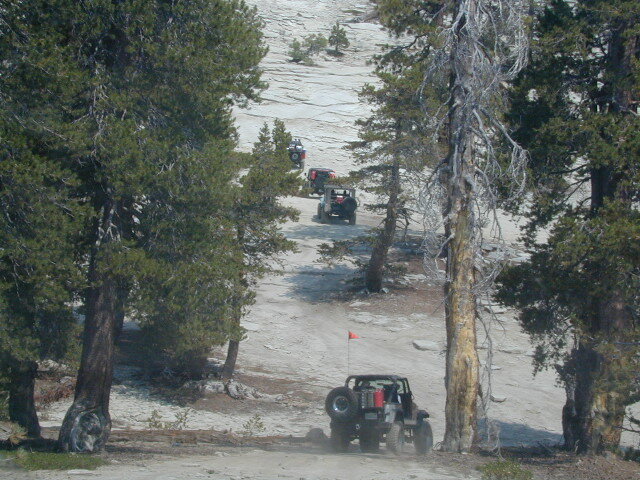 California has trails for OHV use – which means ‘off highway vehicle’, that can accommodate your machine. These remote camps are always primitive camp sites, with picnic tables, fire rings & maybe a pit toilet (if you are lucky). You can find total seclusion on these back roads & trails, well away from the developed campgrounds & RV parks. Anza Borrego Desert 4×4 Trails – pretty much everywhere in Borrego desert is off road heaven. Minimal pavement and maximum desert means dirt road galore, white sandy washes, slot canyons, badlands, wind caves, wildflowers, petroglyphs, boulder outcroppings, old railroad trestles and so much more. The San Diego desert elevations range from near sea level to 4000′ on the eastern slopes of Laguna Mountain. 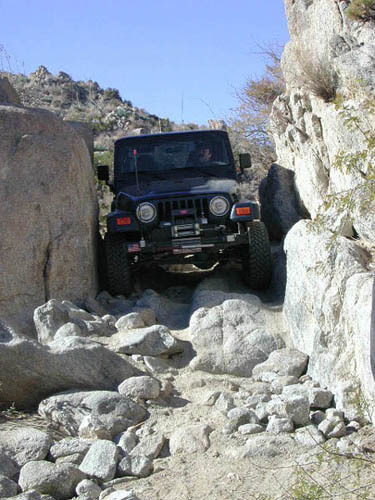 San Bernardino National Forest – has a few trail camps for 4×4 enthusiasts. John Bull Trail (near Holcomb Valley) has one real awesome spot with great views over the desert night lights. Holcomb Creek Trail also has a few spots near the creek. Overall this area is somewhat crowded for wheelin’ (especially on the weekends), as the population is so dense nearby. Los Padres National Forest – the most 4×4 camping readily accessible to Southern California. 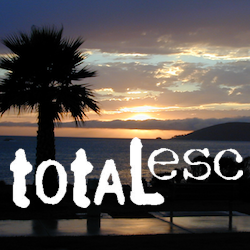 Tis is the best kept secret for Angelinos wanting an escape. The southern portion of the forests has Tecuya Ridge #9N22, with several camps only minutes from I-5. Out west, Cerro Noroeste Road has the Blue Ridge & Quatal Canyon #9N09. Hwy 166 leads to Miranda Pines towering above the fields of Santa Maria & so much more. 2 OHV parks in the area: Hungry Valley & Ballinger both serve the OHV crowds. The northern section of Los Padres (near Big Sur) has plenty of dirt roads & primitive camps, but none are truly 4×4 routes, as most can be accessed easily with a passenger car. 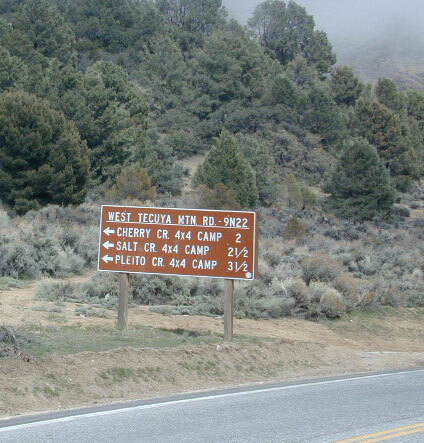 Sequoia National Forest – Southern Sierra Nevada area has 4×4 camping right along the Kern River, near Keyesville, at the junction where Hwy 178 meets Hwy 155. Also, further up the Kern, Forest Rd#22S82 leads to primitive Camp 4, where there are several spots near granite pools, that can only be accessed by 4 wheel drive. Sierra National Forest – central Sierra forest has plenty of 4×4 routes that lead to granite rock gardens & mighty fine, secluded, forested camp sites. Gorgeous Red Lake & Coyote Lake are popular spots that require some technical skills & much patience to access. Both are frequented by fishermen & horses. Bald Mountain trailhead has awesome creekside camps on Rock Creek. Up near Wishon Reservoir is the dead end trail of Spanish Lake. Onion Springs Meadow is awesome back behind Edison Lake. Near the granite wonderland Courtright Reservoir is the infamous Dusy Trail signed #28E34 (aka #7S32, the Dusy Ershim), second only to the Rubicon Trail for high Sierra granite. 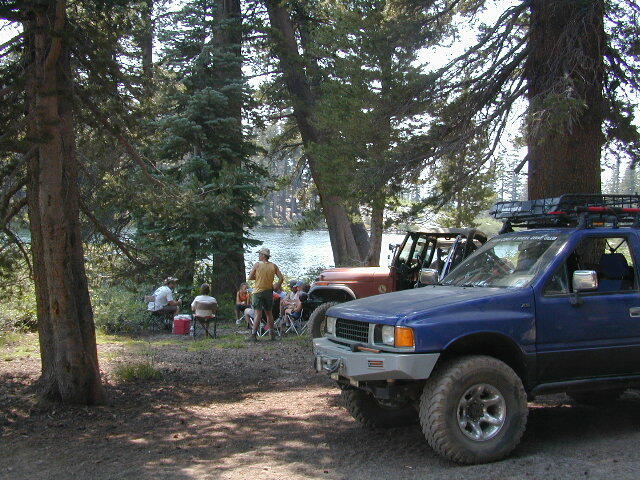 Stanislaus National Forest – camping in the Crandall & Niagara Creek OHV section of the forest, right off Hwy 108. Elevations range from 5000′-7000′. Higher up on the other side, Levitt Lake (access road near Levitt Falls) on the east end of the mountain range, east of the Sonora Pass sign. 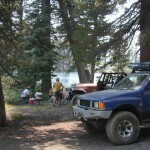 El Dorado National Forest – has the area called Rock Creek for off roading in the Gold Country. Plus the ever popular Rubicon Trail starts hear (near Georgetown) & leads 20 miles across the High Sierra Nevada granite slabs to Lake Tahoe. Lakes Basin Recreation Area – Northern Gold County, just above the Yuba River. Gold Lake has many campable lakes. The area sees a lot of snowmobile traffic during winter snows, but warmer months are the time for fishing and camping. Most of the big lakes have small developed campgrounds, some are minimal, or primitive style camp sites on dirt roads without facilities. Maybe a picnic table at most. Smith Lake is a place that fishermen and 4×4 love. It is small, secluded and kinda hard to find. You’ll need a good topo map of the region. Situated on the border of Tahoe and Plumas National Forest off the Gold Lake Hwy (aka Road #24). The PCT cuts thru this Lakes Basin area w/ Sierra Buttes There are dirt roads and off road trails leading deep into the backcountry from the Packer Lake and Gold Lake areas. Plumas National Forest – out near Quincy, somewhere off the long and winding La Port Road, a few decent 4WD trails thru forest. Access ridge lines or the big river. Great fishing, amazing scenery & very secluded. This coastal range is dirt road heaven, graded dirt roads, ridge routes, hiking trails, equestrian trails, big lakes, small lakes, creeks, meadows, forests, wilderness and 4×4 routes. Snow can be the most fun and challenging for the 4WD crews. Mud, snow, some road closures seasonally. South of Snow Mountain Wilderness, plenty off road trails leading to peaks and ridge lines. Numerous small campgrounds to choose from, trailheads everywhere, acres and acres of wild mountainous areas, and a lake resort nearby. Lake Pillsbury is kinda the center of all the 4×4 action in Mendo. And yes, no question about it – you WILL NEED printed hard copy map to get to these great spots.